Shadow Work by Machine is a technique invented, perfected and patented by designer Suzanne Hinshaw. Patented designs created Suzanne are the only genuine, legitimate designs for shadow work by machine. That's fine - because her designs are timeless and elegant and are totally goof-proof. I promise. If you follow along here, you will see just how easy it is to create the beautiful embroidery you see in the image to the right. You'll be amazed to see the shadow work coming to life before your eyes, and you will be even more pleased when you see the looks of delight when your one-of-a-kind keepsake is received. The technique mimics the traditional hand technique with the convenience of computerized machine embroidery. In the handwork version, the thread is worked back and forth beneath the fabric. The thread under the fabric shows through the fabric and the stitches that come to the top of the fabric form the outline. In the machine version, preliminary base stitches are placed on a piece of fabric or stabilizer to form the "shadows" that show through the fabric. The second, top layer is smaller than the bottom layer, so it's necessary to use a template to make sure that placement is correct on the top layer. 1. Hoop a piece of midweight crisp tearaway in a 4" hoop. Apply a piece of double-stick tape at the top and bottom of the hoop and load it in the mac hine. 2. Print a template and place it in the proper position on the top layer of the bib. Place a pin through the centerpoint. 3. Use the pin placement to place a target sticker from www.dzgns.com or other marker on the bottom layer of the bib. 4. Stitch the preliminary base stitches on the first layer of the bib, keeping the top layer pulled back out of the way. Trim jumps stitches as you go to avoid them becoming trapped or showing through the top fabric layer later. 5. When preliminary base stitches are complete, position the top layer of the bib over the bottom layer. Resume stitching with the first outline color. 6. Continue stitching all outline colors until the design is complete. Add an initial to further personalize your keepsake creation. 7. Pull the bib from the tearaway base and clip excess threads. The shadow work is complete! The reward of this technique is an heirloom-quality gift for a very special baby. The elegant appearance is unique and looks like it took much longer than the few minutes of machine time it took to create. The beautiful embroidery and the memories will last a lifetime. Visit www.myembroiderymentor.com to get your genuine Shadow Work by Machine kit, including designs, proper stabilizer and bibs - Designs by Suzanne Hinshaw. This is really beautiful! 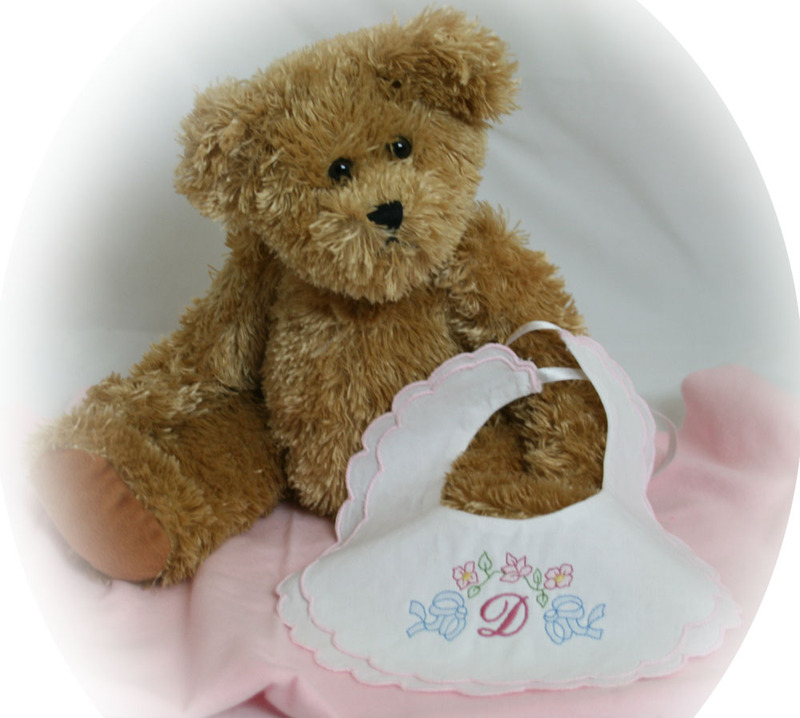 Keepsakes of this type are sure to be favorites for so many mothers. Congratulations on being named in Stitches Magazine top 56 persons who are ". . influencing the direction the decorating industry will take in 2011 and beyond." I have had a design set by Suzanne Hinshaw for a long time now but it wasn't until this article that I knew how to use them. Thanks a bunch!